The Maccabiah 2013 games have come to an end, and the time has come for us to return home. 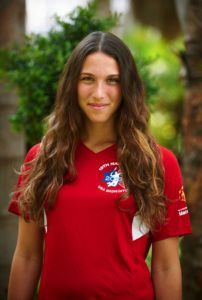 As I begin my preparations for leaving after my many months here in Israel, I realize that the Maccabiah experience is a perfect culmination. Maccabiah has been much more than just a sporting event for me. I have met some amazing people and gotten the opportunity to play alongside them in the sport that I love, Badminton. I have visited sites in Israel I hadn’t been to yet, and I had the chance to speak with others about how meaningful it was to be here as a part of this historical gathering of young athletes from around the world who all share in common our love of sports and our Jewish Identity. 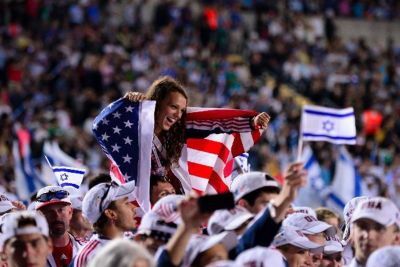 For those of us on the United States Team, our journey began with a week-long “Israel Connect” experience. While we woke up for early morning practices and training, the rest of our day was spent touring and learning about the history of Israel and exploring the various connections that it can inspire for those of us who live so far away as we try to understand its significance to the Jewish people, and to each of us individually. Although I saw and learned many things in these travels, the most powerful day to me was on Tisha B’Av. 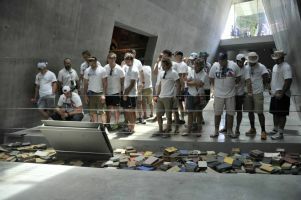 In keeping with the somber tone that encompasses all of Israel on Tisha B’Av, we visited Yad Vashem, Israel’s National Holocaust Museum and Memorial. Although I have been to Yad Vashem a few times before, this time felt different. Not only was I there on a day of such important history to the Jewish People, reflecting on our generations of suffering and survival, but also because our tour guide spent extra care to share the personal stories of Athletes that perished in the Holocaust. This deepened my understanding that the Holocaust affected the lives of so many people, even Olympic athletes and, now, has touched the lives of us, the next generation of Jewish Athletes from around the world. We ended our visit with a special ceremony for all of the Athletes who perished in the Shoah. Brief biographies highlighting the lives of Jewish Olympians were read and the ceremony concluded with the singing of our national anthem, Hatikvah. I was moved beyond words. The connection to me was clear: our history, our people, our future. It was an honor to be a part of it. The next time I heard Hatikvah was at the opening ceremony of the games. I could feel the mood of the athletes around me, and their excitement and joy were palpable. 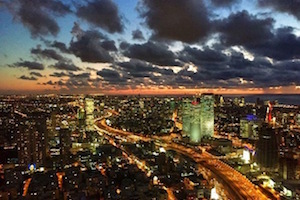 We celebrated that the Nation of Israel lives on, and that its people are thriving in all corners of the earth. 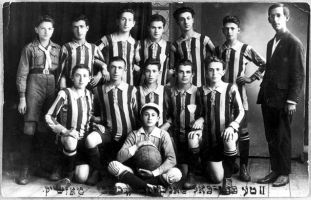 It felt good knowing that in a stadium of 34,000 people, most were Jewish, and all supported the Maccabi movement and its efforts to build Jewish pride through sports. We may have been competing against each other, but there was a sense of community that pervaded every moment of the Games. I could feel this support each time I walked out onto the court for a match. 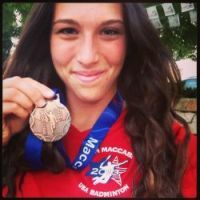 Our United States Maccabiah Badminton Team performed really well, and brought home 7 medals for our country. 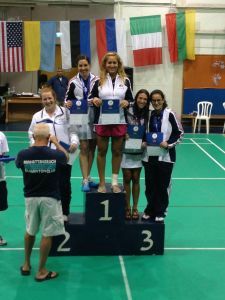 I, along with my partner Marissa Levy, helped add to the US medal count with a Bronze medal in women’s doubles! I am ecstatic to have won a medal, but beyond that I am proud to have competed in Israel, in an amazing event, with Jewish teammates who I can now call my close friends. How has this experience affected my life as a Jew? How can I keep that alive the spark of connection with Israel that was ignited by this powerful experience of Maccabiah 2013? 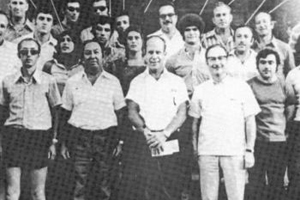 Beyond the memories, is there something I can do continue to the sense of belonging that I felt on those courts and during those games that helped me know that I was a part of Am Yisrael just like everyone around me? If you too, are thinking about questions like these, I hope you’ll join me and declare your pride as an Athlete4Israel. 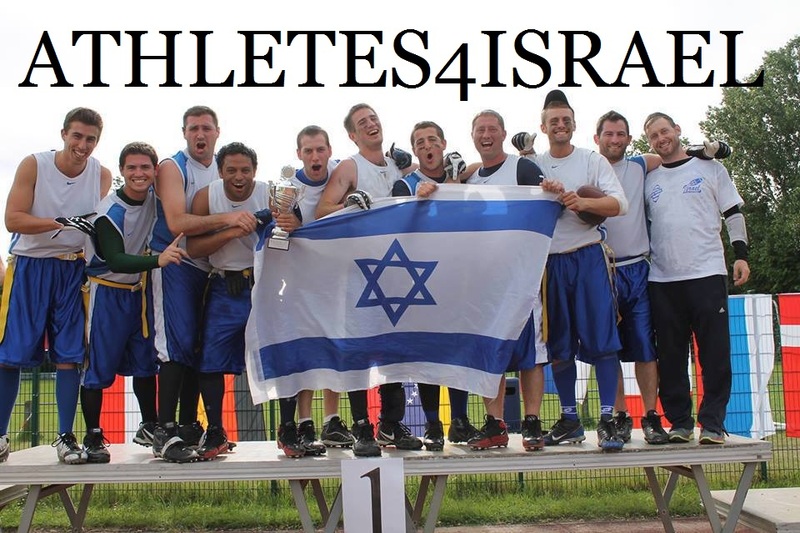 Wherever you are, whatever you are doing with your love of sports, you can share it with others around the world who will celebrate your successes and honor your commitment as we all strive to keep Israel in our hearts, on our minds, and in our lives.